Cut out the activity cards and hand them out face down to the students. The students must stand up, walk around the class asking or answering their question until the have found their pair. 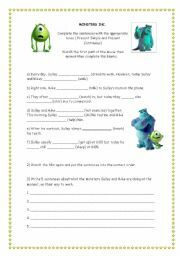 You need to use the movie Monsters Inc with this worksheet. The student´s need to watch the first minutes of the film to write about what Mike and Sully are doing, using the present simple and the present continuous. 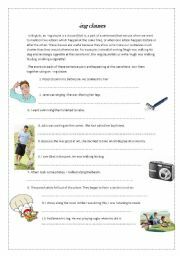 This is a simple Present Simple practice worksheet where the student has to complete with the correct conjugation of the verbs. The second part is to practice prepositions of time. For students to practice when to use -ing clauses. This powerpoint is to introuduce would and could. This presentation explains when and where you can use the Subjunctive tense. It also has some exercises that the students can do. You can modify it all you want. Students discuss their favorite movies and the different genres that exist. then they see how they can describe movies with adjectives using -ed and -ing endings. I had to cut out many pictures as the size limit is only 2MB, so you can add more pics to the slides. This is a review of the past, present and future tenses. with pictures to get the students talking about what the remember and grammar examples for each tense. This PPT introduces Earth Hour and the idea of being enviromentally friendly. Sts discuss what they can do to save energy, etc. it also introcuces relative pronouns and clauses. Hope you like it! 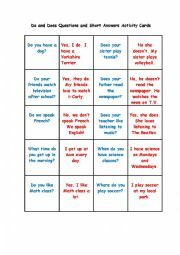 Introducing questions with Do and Does in a fun way,asking questions about characters the students will know. This powerpoint presentation is to describe Lewis Hamilton´s daily routine. Students have to guess who is being described and they see the Present tense along the way.